It’s been a few months since I’ve taken a real ride thanks to the usual job and life responsibilities, but with nice weather on the horizon, I’m reminded of rejuvenation and that it’s time to get back on the trails. And, I’m not talking the well-known trails of Colorado or Utah, but the trails of Palo Duro Canyon State Park, my own backyard, my Texas Panhandle playground. Mountain biking opportunities are surprisingly plentiful for what is considered a flat, treeless landscape around Amarillo, Texas. 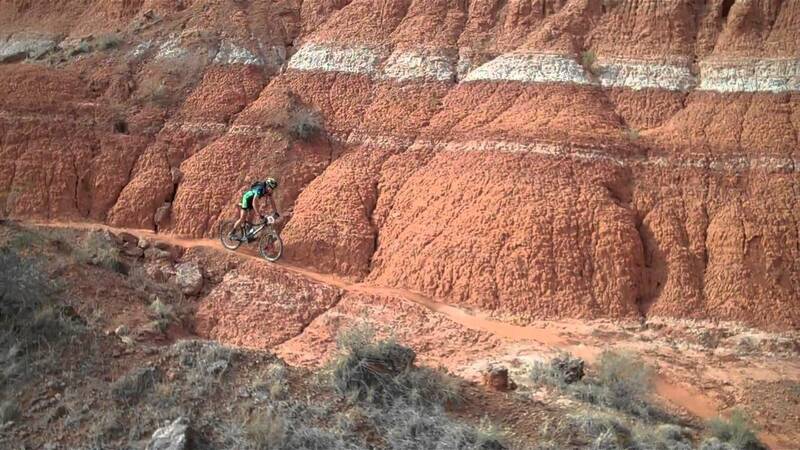 Palo Duro Canyon, our nation’s second largest canyon, opens up from a flat plain to an 800-foot deep canyon covering over 20,000 acres, and for bicyclists, a hearty 15,000 acres with over 10 quality trails to explore in Palo Duro Canyon State Park. It wasn’t until 1934, after the canyon was used as the first commercial ranch, that the upper canyon officially opened as Palo Duro Canyon State Scenic Park. Today it’s visited by over half a million visitors a year, as a recreational and scenic hot-spot full of possibilities. As I take one last sip of my coffee and lock up the car, I can’t help but think of the history these steep, colorful canyon walls, from prehistoric man and animals to Native American tribes to members of Francisco Vásquez de Coronado’s expedition. I wonder about the lives that each of these inhabitants once led. After climbing the last steep portion of the trail, I take a moment to sit atop Rock Garden’s precipice, to soak in the picture-perfect view. I slowly gaze left to right, right to left, at the full spectrum of the park and realize just how lucky I am to have this striking piece of nature so accessible. Capitol Peak – an intermediate to advanced 3.5-mile trail with a few deep sand sections, difficult, steep climbs, and tight corners. It starts out climbing on a wide trail, but continues as a singletrack trail. There are bypasses for some fun obstacles that can get both wheels in the air. Givens, Spicer, Lowry – just over 3 miles of intermediate trail providing a good workout coupled with top-notch scenery. GSL consists of some short punch climbs and technical climbs along parts of this steep, rocky singletrack. GSL used to be considered the most technical trail system until the addition of Rock Garden and Comanche. Rock Garden – an advanced trail that runs 2.39 miles and gains 600 feet in elevation from the bottom of the canyon all the way to the top. It’s a perfect place for viewing the canyon, if you’re up to the steep challenge and over 20 tight switchbacks and corners. Comanche – another advanced trail that’s quite the technical battle and is more like a black diamond when comparing to ski slopes. Make sure you know what you’re doing. Little Fox Loop – a fun, flat, windy loop that goes through some trees. Be sure to make a stop at the picnic table and sign your name in the adventurers’ book and look out for a few sandy spots. You may hear someone mention Cottonwood Flats, but it’s just a portion of Little Fox. Little Fox is also considered an extension of GSL. Juniper Trail – a shady, fun, two-part trail. Juniper Riverside goes in and out of the trees with some shady sections, has views of the beautiful Spanish skirt formations, and is considered intermediate with 1.07 miles of one-way trail. Juniper Cliffside is longer with 2.83 miles one-way and is on the other side of the road from Riverside. It has some steep sections and technical runs. Cliffside is a pretty trail and runs beside curious percolation caves created by running water. Lighthouse – the fun 5.7 mile round-trip Lighthouse trail is probably most popular with beginners, but has bypass sections for more intermediate fun. Take note that this is a highly traversed hiking tail and that you have to park (and should lock) your bike midway through if you want to make the climb and actually reach the lighthouse, which is considered the signature image of Palo Duro Canyon. Sunflower – a relaxing 1.17 mile one-way ride along Sunday Creek, with streaks of white gypsum running though the canyon wall, perfect for novices. Rojo Grande – about 1.07 miles one-way and connects to Sunflower. Rojo sits at the bottom of the canyon and is shady and scenic. Paseo Del Rio – a 1.03-mile one-way trail along the river that’s smooth and shady. Stop at the cowboy dugout for a glimpse of the 1880s. Palo Duro Canyon State Park, less than half an hour from downtown Amarillo, is open year-round, and during summer is opened from 8AM-10PM, 8AM-8PM most other months (with Friday and Saturday until 10PM), but closes at 6PM during the winter. If you’re camping in the canyon you’ll get a gate access code to come in after hours. Costs for entering the canyon run $5 per person and Free for kids 12 and under. Ask about money saving season passes, 806-488-2227. Important note: The canyon can get extremely hot and dry, especially during the summer months. It is vital that you bring lots of water and stay hydrated, remember your pets too. Special thanks to Michael Fiore of Outdoor Element Sports (806-353-2900) in Amarillo, Holly Strickland, and to Chad Glasco with Sun Adventure Sports.